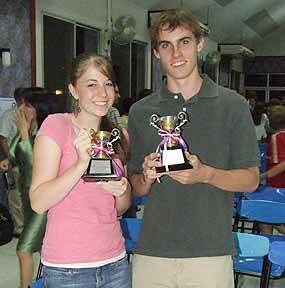 Chiang Mai International School held its first Inter-House Sports Finals and Sports Awards evening on June 4, 2007. CMIS implemented a traditional four-house system, wherein each house is named after a mountain in the northern region of Thailand, and is assigned a primary color: Doi Ang Khang (blue), Doi Chiang Dao (yellow), Doi Inthanon (red), and Doi Suthep (green). The special day began with elementary and high school inter-house football (soccer), followed by futsal and volleyball matches, and capped off with basketball finals. House Ang Khang took most of the honors this year, but Suthep, Inthanon, and Chiang Dao were all also represented in the winner’s circle. CMIS Athletes of the Year Jake Wannemacher and Becca Couch. Photo by Spencer Davis. In the evening ceremony, the overall house winners for each sport, together with the elementary house champions, the high school house champions, and the school overall house champions, were presented with awards. At the beginning of the event, Athletics Director Mike Wood gave a speech about some of this year’s sports program highlights, as well as providing a glimpse into his plans for next year. Then the many hardworking coaches who gave up hours of their time to contribute to the success of the after-school athletics program were introduced and thanked, and the presentations to our athletes then commenced. The first award given out in each of the four main sports was for Most Valuable Player, voting for this award was done by opposition teams and their coaches. The next awards were for Most Improved Player. These recipients were decided upon by CMIS coaches. Principal Terry Gamble gave out a total of 56 awards in those two categories alone. Under the schools new Gold and Silver Colors award scheme, which is based upon the old British tradition of gaining your blues at Oxford or Cambridge, another 35 awards were presented by Director Supaporn Yanasarn. An official presentation was then made of the six Chiang Mai Athletics Conference (CMAC) championship trophies won by CMIS teams during the 2006 – 2007 school year, including: Under 13 Boys’ and Girls’ Basketball, Varsity Boys’ Basketball, Under 11 Boys’ Futsal, Under 13 Girls’ Futsal, and Varsity Boys’ Futsal. The final presentations of the evening were made to the year’s top male and female athletes. Several talented students were nominated for these prestigious awards, and all students from Grades 6 to 12 who took part in the sports program at CMIS had an opportunity to vote for their choice. The male athlete of the year award went to Jake Wannemacher, and the female athlete of the year was Becca Couch. Well done, and congratulations to all! Since 2006 the British Council Chiang Mai has been linking schools in Chiang Mai with schools in Leicestershire in the UK. These links have been through the British Council website ([email protected] .or.th) and the schools have shared photos, videos and blog’s, exploring each others different cultures and customs and of course the similarities which exist between teenagers in this global world. 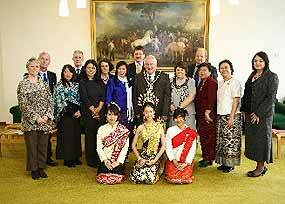 The Thai teachers and students were received by the Chairman of the County in Leicestershire during their memorable visit to the UK. In March 2007 the BCC was able to send three Thai teachers and three children to the UK. They spent a week in Leicestershire and London and visited their partner schools. Meeting face to face has really motivated the children in the UK and we are now strengthening the virtual links between the schools by holding monthly workshops where the Thai children agree projects which they will then post on the site. During the visit the Thai youngsters demonstrated traditional Thai dancing which really impressed the kids in the UK. The teachers and students also visited the town hall for a formal reception with the Chairman of the County. 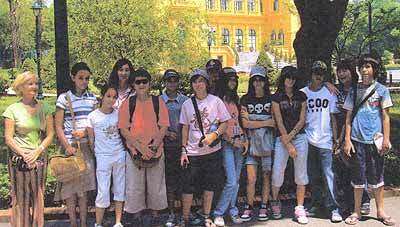 The Lanna International students on a field-trip to Vietnam as the explore and learn the history of a foreign country. For the first time Lanna International School offered its students an opportunity to travel and study outside of Thailand. Last month a group of students from grades 7 and 8 and their French teacher Ms. Ketty left Chiangmai for Vietnam. The first stop was Hanoi, the capital city in the North where students had the opportunity to visit many places where former President Ho Chi Minh used to stay. The second day a boat-trip on a “junk” took them all around the scenic Halong Bay, exploring caves and enjoying fresh seafood. Then they flew to the ancient capital town Hue with its Perfume River, Holy Lady Pagoda, Royal Palace, and Emperor Tu Due’s tomb. The next day they discovered the particular city of Hoi An, famous for its typical Chinese town houses, streets laid with cobble stones and rickshaws. Their last destination was Saigon, also known as Ho Chin Minh. This big city surprised everyone with its French colonial buildings, its extraordinary Central post office and its covered market. The visit to the Cu Chi tunnels where the Vietcong used to hide during the war and was the highlight attraction for all the students. The adventurous students learned plenty about Vietnamese history and their civilization. They enjoyed the beautiful countryside scenery and enjoyed the local food. Their trip will last them a lifetime of memories. The Royal Institute will launch an online version of the 1999 edition of its Thai dictionary on the website sanook.com at the end of July to promote correct usage of the Thai language. Mrs. Jintana Phanfak, secretary-general of the Royal Institute, spoke about the online version of the Royal Institute Thai Dictionary 1999, stating that the web-based dictionary will enable users to search the meanings of about 40,000 officially used words. The project is progressing under collaboration with Sanook Online Co. Ltd., which owns the sanook.com website.